So how do we go about building community? If it’s needed so much, why aren’t we more adept at creating sustainable communities and how can we do it better? This is a huge question in our culture today. How do we create relationships that feel safe, especially when we are vulnerable and need support? share our true or “authentic” selves—responsibly and with ownership of the “good” and the “bad,” the easy and the tough, the light and the dark sides of self. 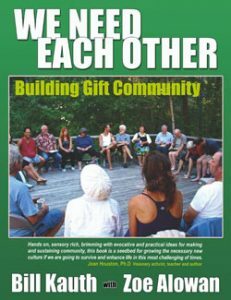 When we take these steps to build connections with ourselves and one another, each member of the “tribe” is more resourced and able to offer their unique contributions. Without enough support, suffering is inevitable. Benefits of Community for each of the various layers of community surrounding a family. Learning. Being connected means greater opportunities to learn from each other, mine each other’s wisdom, and help each other thrive. Connecting. By being more closely interconnected, each member of the community is able to enjoy a wider, richer network of resources, wisdom, connections, and support. Creativity and Inspiration. Connections with different people of varying ages, backgrounds, careers, etc., exposes individuals to new ideas and new ways of looking at old ideas. This cross-pollination of ideas can be a great source for ongoing creativity and inspiration. Practical Help. An extended community surrounding parents can help with daily tasks like running errands, cooking, shopping, homework, transport to sports, etc. Two or four hands are not enough to meet the needs of an entire family. When many hands work together, the load becomes easier to manage and the days become more joyful. Wisdom. When people work together to parent (including older siblings), each “parent” will offer different ways of doing things—often introducing new ideas to the primary parents. New perspectives, passed-down learning, and shared wisdom are some of the ways community can make life easier for parents. For brand-new parents, this can be a wonderful way to avoid painful mistakes, though sometimes the only way to learn is by doing. The wisdom of others becomes a gift of choice for new parents—take the best and leave the rest. Social Connection (aka, Love). Many parents run from home to school to work to school to home to bed to school again—and again. Having a community of people to see and connect with in the mix of otherwise routine days can make life feel more fulfilling and meaningful. We are social creatures who need love and connection. Time Together. When a community surrounds parents, they have more time together (alone). For a couple to have regular date nights, and also for community members to have the knowledge that they are growing sustainable bonds with their child(ren), this two-fold support nourishes them and facilitates deepening their connection. Reflections. Community members can remind a couple-ship of who they are. These reflections can be a source for ongoing nurturing and a valuable contribution during times of conflict by helping them to remember the good. Support. Similar to reflections, others in a community can offer much-needed support and guidance as a couple grows. The joys and challenges of life often require support to move gracefully through life. Support can make all the difference. Witnessing. As children grow, they crave to be seen–who they are, what they are learning, what they do well, and what’s unique about them. When more people know a child, the child gets greater affirmation and reflection of themselves, which can result in increased self-esteem, more confidence and greater mental health. What a wonderful foundation and benefit arising out of community! Discovering Gifts. Within community, there are many (and deep) needs and opportunities of expression and contribution. Children can explore meeting various needs of others in the community, and as they do, they can explore what their natural gifts are. Establishing Values. Being raised in a community exposes children repeatedly and diversely to its values. A community can actively cultivate a set of desired values as they nurture each other, create the community experience, and support each other in daily life. Belonging. We all crave belonging. When we have others around us who relate to us as important, a basic need is met, allowing us to function at a higher level. Plus it’s one of the best feelings to know we’re a part of something. To be-long is to live long and happily. Authenticity/Acceptance. Within an environment of belonging, community members can experience a sense of safety, which can allow a more real version of themselves to show up in interactions. Within a safe community, members may have the space to truly be themselves and establish more intimate relationships with friends and loved ones because more of the real person is accessible. Growth. When many come together, it’s inevitable that conflict will arise. Healthy conflict is the life-blood of community and provides valuable opportunities to learn better ways of conflict resolution, communication, boundary setting, forgiveness, acceptance, unconditional love for self and others, and ultimately, personal growth. Strength/Sustainability. Healthy and growing communities represent the very essence of sustainability. When community members can rely on each other and are working together with common goals, individuals become healthier and stronger—and more able to give their best. When many are working together to give their best and take care of each other, what comes out of the community as a whole is more stable and productive. Creating many sustainable, strong communities, results in a sustainable and stronger global community. Health. As described above, people caring for each other results in better cared-for, healthier people. Healthy people make a healthy community; healthy communities make a healthy planet. Health can be physical, mental, emotional, spiritual, and even social, within a tiny circle, like a family or a larger one like a school, a church, or even a town. Resources. Many people working together represent a wide network of resources. For example, one person may know about construction or baking, while another may know about websites or darning. One of the resources offered through the CCTF network is the community-building work of Bill Kauth and Zoe Alowan. They, in conjunction with their community, have created brilliant tools for groups, families, and individuals wanting to create deeper ties. Beyond their book, We Need Each Other, they offer consulting and trainings to individuals and groups, both online and in person. Other tools for community building are: shared meals with multiple families, finding local families or individuals to share housework or building projects together–each family receiving support one day of the month (or quarter) from the whole group. Collaborating with three families, takes four days a month or quarter. While that may seem like a lot, dedicated time and attention is one of the essentials to deepening connection. How it happens is up to you. Many hands make light work. disaster. It is the result, and further creator of disconnection, intimately entwined with MPAS. It’s time to revitalize our partnership/parent-couple relationships—and build strong, sustainable communities around them. Let’s turn this epidemic on its head—let’s grow together and ensure a thriving future for families.